Gambling can often start off as a hobby, an enjoyable pastime that does not become a problematic behavior in most cases. Then, over time, gambling can become an addiction in much the same way that drugs and alcohol can. When someone becomes addicted to gambling, their entire life and the lives of their loved ones can suffer because of it. If you enjoy gambling as a harmless leisure activity, you may want to make sure that you aren’t in danger of having it become more than that. Read on for the signs of gambling addiction to look out for, and ask yourself if your gambling has reached unhealthy or uncontrollable levels. According to the MDHS, “85 percent of U.S. adults have gambled at least once in their lives, 80 percent in the past year.” While this does not mean that every individual became addicted to gambling afterward, there is a chance that someone with a certain predisposition to become a compulsive gambler may possibly get to a point where they are addicted to the activity. Like with substance abuse, many individuals who gamble like the way it makes them feel. They start to crave that feeling more than anything else and will neglect other responsibilities and important aspects of their lives in order to gamble. How Do I Know I’m Addicted to Gambling? If gambling has started to have a negative effect on your life, you may have an addiction. If you realize that you gamble more than you should, that your gambling is affecting other aspects of your life negatively, and you still feel that you cannot stop, then you are addicted to gambling. You will notice the signs of these individual issues associated with gambling addiction in your behavior, your physical appearance and health, your attitude toward your responsibilities and others, and your attitude toward gambling itself. Once you start to suspect that you might be gambling too much, ask yourself: Will I be able to stop right now? If you do not think that you are capable of stopping, or if you try and discover that you are unable to do so on your own, these are strong signs that you already have a gambling addiction. You may be concerned that you are already addicted to gambling. If you are, start looking for the signs of gambling addiction and ask yourself if you exhibit them. Some of the most common signs are similar to other types of addiction syndromes while there are a few that are specific just to gambling itself. If you are at the point where you cannot think about anything else or perform any other type of activity without your mind wandering toward your bets or how you can possibly gamble on a situation, you have a problem. Addiction not only takes over your mind but, over time, it starts to change the way it works. If you become addicted, eventually gambling will be the only thing you want to think about. Lying about gambling, how much you gamble, etc. When your loved ones ask you about your gambling habits, do you tell them the truth? How about when your therapist asks? Or do you hide your gambling altogether? If you feel the need to lie about your gambling, how much you gamble, or how much money you made/lost during a gambling session, this is a red flag. We all have hobbies that we would rather be doing than working or dealing with other miscellaneous issues. But if you are beginning to spend all of your free time gambling to the point where it bleeds into the time you should be spending working, being with family, sleeping, or doing other important activities, you are not in control of your gambling. It has moved from a hobby to an obsession and, once it becomes detrimental, an addiction. Many addicts feel this way. They feel very guilty or ashamed of themselves and swear that they will stop gambling. But, then, once they feel compelled to gamble again, they are right back to it. These kinds of feelings are definite signs of addiction. Money for food, rent, things your children need, work expenses, and other important things should not be spent on gambling, which many gamblers do understand. However, once someone’s gambling habit can no longer be sustained by the money they can afford to use on it, they sometimes start using money allotted for other responsibilities and important necessities which can lead to extreme issues in their life. According to the OSA, “A problem gambler may invent opportunities to gamble.” Any occasion, a birthday, a work problem, etc., will be an excuse to gamble, whether it is some kind of reason to celebrate or a need for stress relief. The individual might also insist on gambling as the only way to have fun when out with friends. “While most gamblers are action-seekers, some use gambling as a way to escape from loneliness, stress, or a troubled relationship.” If you are constantly using gambling as your way to ignore issues that you do not want to deal with, you are abusing gambling in a dangerous way and putting yourself in danger of addiction. There are two types of individuals who are gambling in a way that is dangerous and troublesome. Problem gamblers, according to the DBHDD, are “involved in risky gambling behaviors that often have adverse effects on relationships, jobs and financial security.” They are in danger of becoming addicted to gambling but may still be able to stop. Pathological gamblers, however, are people who have “persistent and recurrent maladaptive gambling behavior that disrupts personal, family, social and vocational pursuits.” These individuals are fully addicted to gambling. If you believe that you may already be a pathological gambler or if you are on your way to becoming one, seeking treatment is the first step to quitting. Signs of Gambling Addiction to Look Out for - It has been discovered that gambling has a similar effect on the brain as drugs do, and that it is an addictive activity. 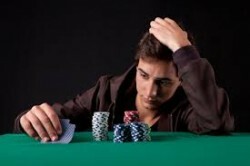 An addiction to gambling has serious consequences, including financial loss, family problems, and psychological issues. Top 10 Gambling Addiction Symptoms - An addiction to gambling is a very serious problem that can impact your life as well as the lives of your loved ones. If you notice any of these symptoms in yourself or someone you know, it is important to get help as soon as possible. Where to Find Gambling Addiction Treatment - An addiction to gambling is very harmful to a person's life, and to their overall well-being. Admitting that you have a problem and need help is a brave move that will radically improve your life, and the lives of your loved ones.